A double pattern with cute twin penguins.The design is suitable for a birthday or a new baby greetings cards. 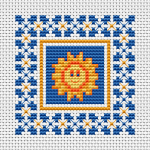 A yellow sun with a kind, smiling face in the sky.Sky is the symbol of spirit, peace and heaven. The sun represents life, energy,strength, power. 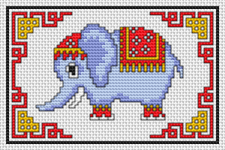 According to the belief, the Elephant brings prosperity and luck.Great gift for boys and girls who adore elephants. 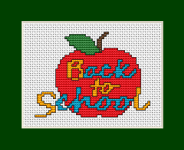 We can hear the school bells ringing again. Back into the school mode with this colorful card. 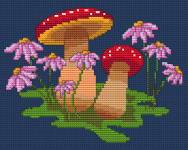 Mushrooms and flowers cross stitch pattern designed for 14 ct Navy Blue Aida. 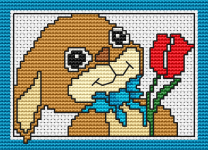 Cross stitch pattern of a cute baby fox with the text:"Happy Birthday". 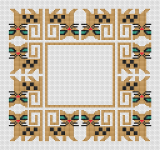 Suitable for greeting cards and other projects for animals lovers. 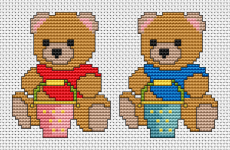 Awesome cross stitch version of Mario, the beloved Nintendo character.